Fred and Emma (Stübe) Wiese were German immigrants who lived out their adult lives in Chicago, Cook County, Illinois. Although both were born in the late 1860s in Mecklenburg-Vorpommern, an area of present-day Germany located along the Baltic Sea, they left their homeland as infants. Fred – or Fritz – was the son of Joachim and Sophia (Cammin) Wiese and is believed to have been born near Wendisch-Baggendorf;1 Emma was the daughter of Ernst and Friederike (Wagner) Stübe and was born in Friedrichshof in Ritteramt Gnoien.2 These rural communities were not far in terms of distance, but separated by the Trebel River, the Wieses were residents of Pomerania and the Stübes were residents of Mecklenburg. 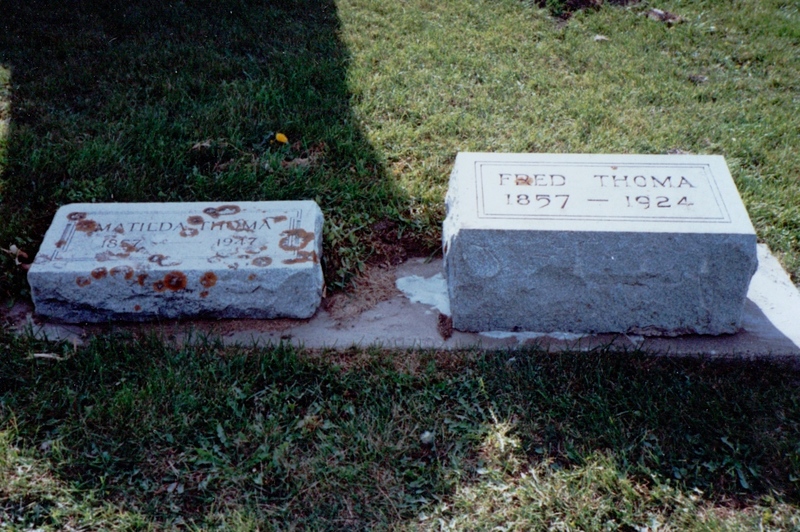 Grave of Fred Wiese (1866-1914), Elmwood Cemetery, Chicago, Cook County, Illinois; 2006, privately held by Melanie Frick, 2015. Grave of Emma Wiese (1867-1937), Elmwood Cemetery, Chicago, Cook County, Illinois; 2006, privately held by Melanie Frick, 2015. This entry was posted in Tombstone Tuesday and tagged Chicago, family history, genealogy, Germany, gravestone, Illinois, immigrants, Pomerania, Stübe, Wiese on November 16, 2015 by Melanie Frick. Timothy and Odile (Millette) Adam experienced nearly forty years of marriage together that were anything but ordinary. Timothy, baptized in St. Pie, Quebec on 8 August 1846, the son of Timothée Adam and Marguerite Chicoine, crossed into America with his family as a teenager.1 They settled near the textile mills of Indian Orchard, Hampden County, Massachusetts, which is where Timothy married at the age of twenty-one on 22 September 1867 to Odile Millette.2 Odile had been born in the French Canadian community of Rouse’s Point, Clinton County, New York on 11 July 1847, the daughter of Maurice Millet and Isabelle Quemeneur dit Laflamme.3 She, too, had relocated to Massachusetts as a teenager, where she also found work in the mills. In 1883, the family made the decision to move west.6 I have to wonder if this move was spurred by the deaths of at least two of their own young children circa 1880, as well as by the deaths of Timothy’s younger brother and sister who died within a week of each other in February of 1883: one of pneumonia at twenty and the other of tuberculosis at twenty-four.7 In fact, tuberculosis had caused the death of Timothy’s mother just five years before.8 Perhaps the idea of fresh air and the countryside appealed to the couple as they must have feared for the health of their children. 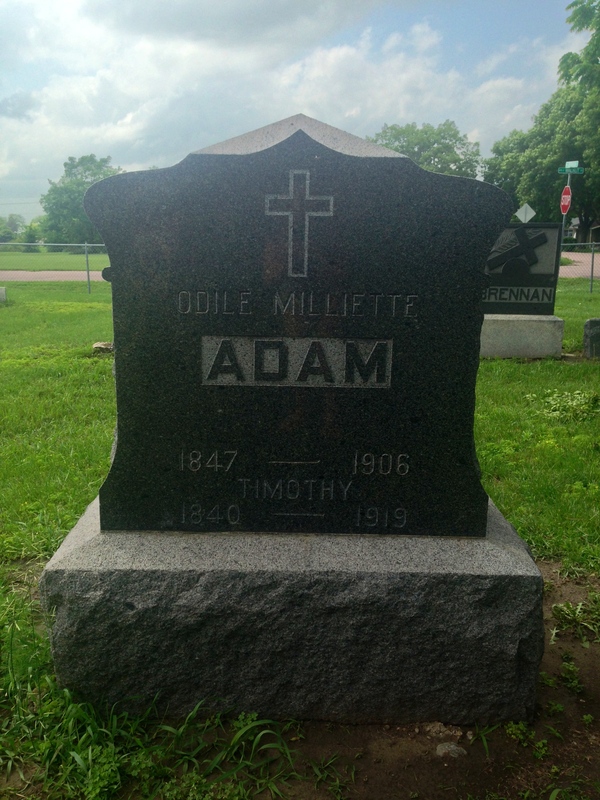 Grave of Odile Milliette Adam (1847-1906) and Timothy Adam (1840-1919), St. Joseph Cemetery, Elk Point, Union County, South Dakota; 2014, privately held by Melanie Frick, 2015. Note: Timothy’s date of birth on his gravestone is incorrect. He was born in 1846. By 1917, Timothy, now seventy, had returned to Sioux City where he lived with his married daughter.21 He died there on 22 February 1919 at the age of seventy-two, his cause of death recorded as senility.22 Timothy Adam was buried beside his wife, Odile Millette, at St. Joseph Cemetery in Elk Point, Union County, South Dakota, his name squeezed as though an afterthought at the base of her gravestone. This entry was posted in Tombstone Tuesday and tagged Adam, Canada, French Canadian, gravestone, immigrants, Iowa, Massachusetts, Millette, Quebec, Sioux City, South Dakota on September 15, 2015 by Melanie Frick. 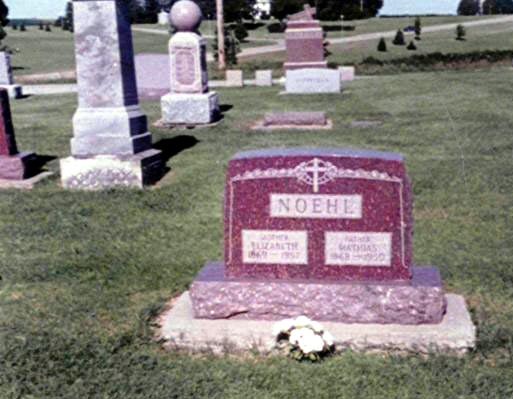 Grave of Mathias Noehl (1868-1950) and Elizabeth Noehl (1869-1957), St. Aloysius Cemetery, Calmar, Winneshiek County, Iowa; digital image date unknown, privately held by Melanie Frick, 2014. Marry they did on 22 September 1896, by the same Father Probst who had been Elizabeth’s employer.5 Mathias later wrote of the “joyless” early years of their marriage, during which time the couple struggled to make a living in Alberta and Minnesota before finally returning, poverty stricken, to Iowa. He wrote, “Although children are not always a blessing for parents, they help to lead many a marriage through the inevitable storms between two persons, whose different characters must be adjusted to each other.”6 Whether his statements were sincere or tongue-in-cheek is unknown, but the couple would, indeed, go on to celebrate the births of nine children: Leo, Helen, Kathryn, Elinor, John, Aloysius, Francis “Frank,” Frances, and Joseph Noehl. This entry was posted in Tombstone Tuesday and tagged 1890s, family history, genealogy, Germany, gravestone, Hoffman, Iowa, Noehl on December 9, 2014 by Melanie Frick.